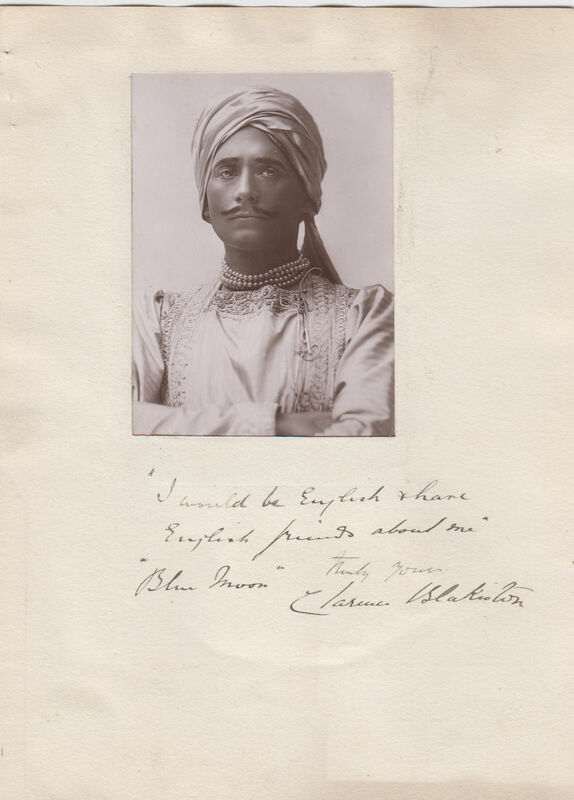 Postcard Portrait of Blakiston as the Prince Badahur Sanatsinjhi of Kharikar in The Blue Moon (1905), inlaid to album leaf with an inscription: I would be English & have English friends about me. [Blue Moon], truly yours Clarence Blakiston. Overall 9 x 6 inches. Undated. Clarence Blakiston (1864–1943), actor. In November 1902 he acted in JM Barrie’s play, “The Admirable Crichton,” at the Duke of York’s Theatre in London.